I love to knit. This isn’t a secret. Knitting is something that keeps my hands busy. I knit while I’m nursing, while I’m watching tv, or anytime I’m not doing something active. It fills a lot of my down time. I have been working on leg warmers for Isabelle. They are my second pair. I use them a lot when we go for walks. They are taking waaayy more time than they should. This is because I have done something to my neck/shoulder/arm. This has been going on for about 2 weeks and it’s not getting any better. I’m slathering on icyhot, and aspercream stretching it out applying warm rice bags, taking ibuprofen and anything else I can think of. I should probably go see someone, but when the inevitable question comes up “how did you do this?” I don’t have an answer, let alone a “cool” answer. The last time I was hurt I was starting/breaking my mare. Kinda cool. 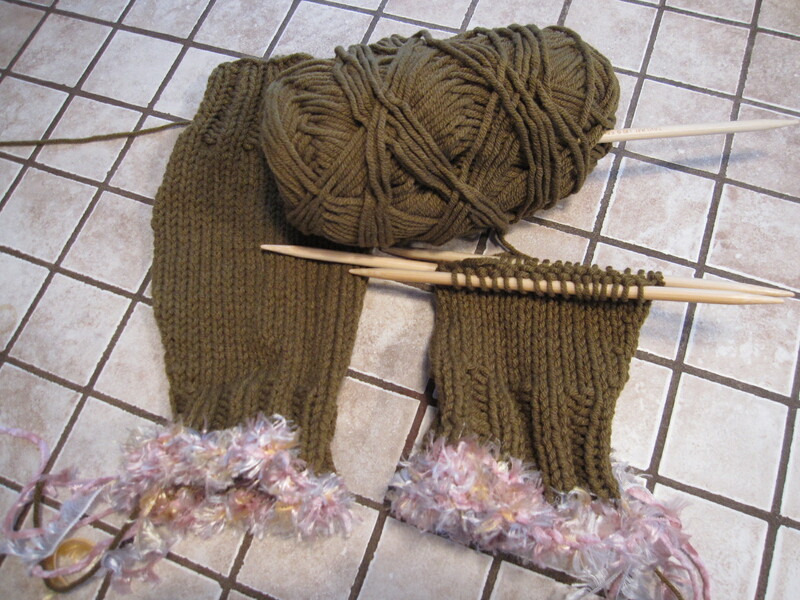 This time the reason is something to do with holding the baby and knitting. Not at all exciting. I’ve thought of making up an injury. Spelunking in Mexico, snowboarding in Colorado, cave diving, anything but, well nothing. After all who gets a knitting injury, other than maybe sitting on a double point needle. Been there done that. (I did not seek medical attention for that one). So now the thing that fills up most of my down time is on the sidelines and trying to figure out how to fill in that time. Any ideas?